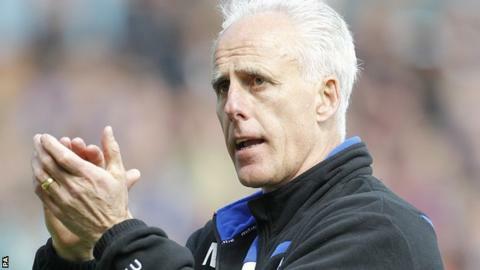 Mick McCarthy's Ipswich side have now won three games in a row. Ipswich held off a spirited late fightback to end Wigan's unbeaten home record and move up to seventh place in the Championship. Midfielder Luke Hyam put Ipswich ahead when he finished Tyrone Mings's excellent low cross from the left. The points looked safe when former Latics player Conor Sammon doubled the lead as he scored from close range. But Wigan responded as Martyn Waghorn turned in a James McClean shot and Oriol Riera thumped the post. Riera was desperately unlucky not to level the score but for 75 minutes it was Mick McCarthy's visitors who were in control. Hyam had been involved in two tasty challenges in midfield when he put Ipswich ahead after a flowing move. David McGoldrick spread the ball out to Mings, and his superb delivery was met convincingly by Hyam to side-foot in. Sammon - who scored once for Wigan during an 18-month spell at the club - should have made it 2-0 moments later when he failed to convert McGoldrick's fine ball. But after the break the powerful Irishman did grab his first goal for Ipswich since signing on loan from Derby County when he broke an unconvincing challenge from Ivan Ramis and slotted home at the second attempt after Scott Carson had saved. Uwe Rosler's home side belatedly rallied and Ramis forced Ipswich goalkeeper Dean Gerken into a fine stop before substitute Waghorn halved the deficit when he flicked in McClean's shot from a corner. And fellow replacement Riera was inches away from securing a point for the hosts when he showed superb technique to bring the ball down, before arrowing his shot against the near post. The result leaves Wigan in 17th with eight points from eight games. "I know a lot of talk will be about the last 10 minutes and the shot that hit the post and another that missed, but we could have been more than one goal up by that stage. "It's nice when a plan comes together, and it did tonight. "I can come up with all sorts of ideas but unless the players buy into it I've got no chance. "Thankfully tonight they did. It was a really solid performance." "Ipswich came with a clear plan, to rough us up, and tried to make the game a scrap. "In periods they dominated our midfield, we couldn't get the ball down, and we weren't strong enough to win the second balls. "But the response we showed in the last 20 minutes speaks for the character of the players and the spirit in the camp." Match ends, Wigan Athletic 1, Ipswich Town 2. Second Half ends, Wigan Athletic 1, Ipswich Town 2. Foul by William Kvist (Wigan Athletic). Luke Hyam (Ipswich Town) wins a free kick in the defensive half. Attempt missed. Emmerson Boyce (Wigan Athletic) right footed shot from the centre of the box misses to the right following a corner. Corner, Wigan Athletic. Conceded by Kevin Bru. Corner, Wigan Athletic. Conceded by Tommy Smith. Substitution, Ipswich Town. Tommy Smith replaces David McGoldrick. Attempt blocked. James Perch (Wigan Athletic) right footed shot from outside the box is blocked. Assisted by James McClean. Oriol Riera (Wigan Athletic) hits the right post with a right footed shot from the centre of the box. Attempt saved. Adam Forshaw (Wigan Athletic) header from the centre of the box is saved in the bottom left corner. Assisted by Don Cowie with a cross. Foul by Iván Ramis (Wigan Athletic). Conor Sammon (Ipswich Town) wins a free kick in the defensive half. Corner, Wigan Athletic. Conceded by Tyrone Mings. Goal! Wigan Athletic 1, Ipswich Town 2. Martyn Waghorn (Wigan Athletic) left footed shot from very close range to the high centre of the goal. Assisted by James McClean following a corner. Attempt blocked. James McClean (Wigan Athletic) left footed shot from the left side of the box is blocked. Assisted by Rob Kiernan with a headed pass. Corner, Wigan Athletic. Conceded by Christophe Berra. Attempt saved. David McGoldrick (Ipswich Town) left footed shot from outside the box is saved in the centre of the goal. Assisted by Daryl Murphy with a headed pass. Attempt missed. James McClean (Wigan Athletic) right footed shot from outside the box is too high. Assisted by James Perch. Offside, Ipswich Town. Luke Hyam tries a through ball, but Daryl Murphy is caught offside. Attempt missed. Martyn Waghorn (Wigan Athletic) left footed shot from the left side of the box misses to the right. Assisted by Don Cowie following a corner. Corner, Wigan Athletic. Conceded by Jonathan Parr. Attempt blocked. James McClean (Wigan Athletic) left footed shot from the right side of the box is blocked. Assisted by Adam Forshaw. Attempt saved. Iván Ramis (Wigan Athletic) header from the left side of the six yard box is saved in the bottom left corner. Assisted by James McClean with a cross. Substitution, Wigan Athletic. Martyn Waghorn replaces Andy Delort. Substitution, Ipswich Town. Darren Ambrose replaces Teddy Bishop. Delay in match Teddy Bishop (Ipswich Town) because of an injury. Attempt missed. David McGoldrick (Ipswich Town) right footed shot from the right side of the box misses to the right. Assisted by Kevin Bru with a headed pass. Corner, Wigan Athletic. Conceded by Luke Chambers. Attempt blocked. Andy Delort (Wigan Athletic) right footed shot from outside the box is blocked. Assisted by James McClean with a headed pass. Adam Forshaw (Wigan Athletic) wins a free kick in the attacking half. Foul by Teddy Bishop (Ipswich Town). Substitution, Wigan Athletic. Oriol Riera replaces Shaun Maloney. Goal! Wigan Athletic 0, Ipswich Town 2. Conor Sammon (Ipswich Town) right footed shot from very close range to the centre of the goal. Attempt saved. Conor Sammon (Ipswich Town) right footed shot from the centre of the box is saved in the centre of the goal. Assisted by David McGoldrick. Attempt missed. Kevin Bru (Ipswich Town) right footed shot from the centre of the box is high and wide to the right. Assisted by Christophe Berra. Corner, Ipswich Town. Conceded by Rob Kiernan.